You are here: Home / Blog / What’s In Your Purse? I’m technically in the ‘off season’, so eating is more relaxed. And when I say ‘relaxed’ I mean ‘more clean food’. This weekend I am at a conference and have to be strong and say no to crack that comes in the form of food. 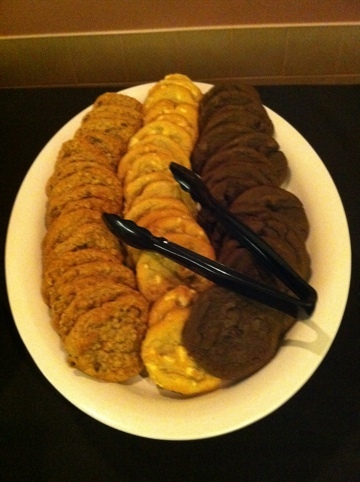 All the free cookies you could...or couldn't want!! 2 bananas, strawberries, blackberries, peanut butter, quinoa, and 16 egg whites! AND it still has all the regular purse stuff. Wowsa! This thing can haul around a day’s worth of food, keep me on track, and still look cute! You go girl! 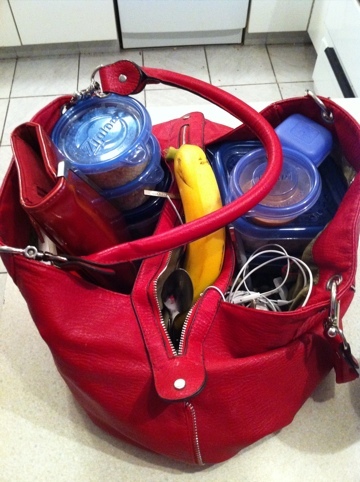 I have the banana, water, ipod, and sugar free mints….at least no junk food here! I HAVE AN APPLE A WALLET AND JUNK….KEYS…..
During my prep last season, I went out to a club with a girlfriend. I refused to miss a meal so I brought a tupperware w/ steak etc. in my purse. You have got to be the strongest person I know. hehe.. the purse.. classic, love it!